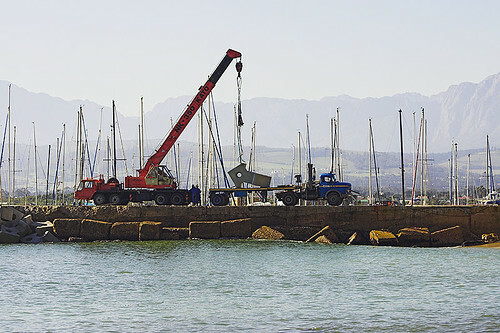 For some years the small harbour in Gordons Bay has been getting silted up, to the point where only the smallest of craft could enter or leave at anything besides high tide. The subject of who should pay for the repairs was long debated between the various parties involved and they clearly came to an agreement as the harbour wall has been closed since the beginning of winter for repairs. I understand that they are closing up holes in the wall that allow sand to be pushed through by wave action. To allow this the wall needs to be protected by additional dolosse, one of which is being put in place here.